Designed by Mary Lake- Thompson for Robert Kaufman fabrics. 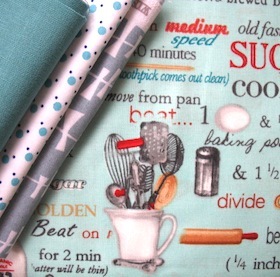 Kiss the cook is a fabric collection with a vintage twist. 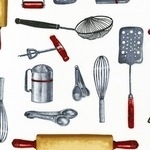 old crockery, cutlery, and retro imagery of kitchen utensils. 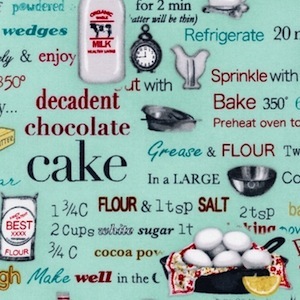 These receipe sheets are fab.. decadent chocolate cake, Dutch baby pancakes and lots more. Scale wise the height of th milk jug is 6cm.